The boss’s favourite – this pie takes our beef pie recipe and makes it even better with the addition of bacon and cheese inside the pie and on top. Eat it on its own or combine with vegetables for a quick and easy dinner. Ingredients: Wheat Flour, Water, Margarine [Vegatable fats and oils, emulsifiers[Soya lecithin, (471), antioxidants (306) and colours(160b,100). 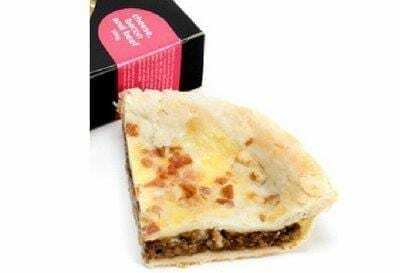 ], 100% Beef Mince, Soya Flour ,Cheese(8%)[Full milk, anti-caking agent (460), salt, mineral salt(509), culture and rennet], Bacon(8%), Milk Powder, Baking Powder, Salt, Mixed Spices, Maze Starch, Preservative(202).